DOGS AND CATS - (267) 385-3800 (Free) If you have a problem with a domestic animal, such as a dog or a cat, please call the county animal services at (267) 385-3800. They can deal with barking or dangerous dogs, animal complaints, animal cruelty and the like. If you want the SPCA, call (610) 489-7510. This is a service that deals with problems with pets, and issues such as pet adoptions, vaccinations, stray dogs and stray cats, unwanted puppies or kittens, lost pets, and things of this nature. WILD ANIMALS - (610) 927-7792 (Private Company: Not Free) We specialize in the removal of unwanted nuisance wildlife from residential homes and commercial buildings. We most commonly deal with the removal of critters from attics, but we deal with all facets of wildlife removal and control. 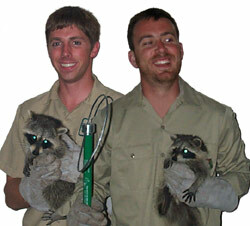 Common scenarios that we deal with include - the removal of squirrels from the attic or soffit of a house - the removal of raccoons from attics or chimneys - the removal of a colony of bats from inside a building - bird and pigeon control at commercial properties - total rat and mouse control - general wildlife trapping (groundhogs, skunks etc). We not only remove all nuisance wildlife species, but we perform preventative repairs to buildings, to make sure that wild animals do not get back in. Philadelphia Animal Control - Click here to go to the home page, and learn more about our services, which include humane wildlife trapping, preventative measures, damage repairs, exclusions, attic cleanouts, animals waste cleanup, and more. Montgomery County Animal Control - If you have a problem with a domestic animal, such as a dog or a cat, you need to call the count animal services, which can help with these problems for free - barking or dangerous dogs, stray cats, lost pets, etc. We service the greater Philadelphia area, including Delaware, Chester, Montgomery, & Philadelphia Counties. We service the towns of Upper Darby, Lansdowne, Broomall, Media, Brookhaven, Chester, Concordville, Newtown Square, Downingtown, West Chester, King of Prussia, Audubon, Norristown, Conshohocken, Wilow Grove, and more. Click Here for an approximate map of our normal service range. We do travel further for larger jobs, or schedule permitting, so if you are unsure about our service range, just give us a call! Read more about some of the towns we service, including: Ardmore, Conshohocken, Bucks County, Harleysville, King of Prussia, Lansdale, Montgomeryville, Limerick, Pennsburg, Pottstown, Quakertown, Willow Grove.